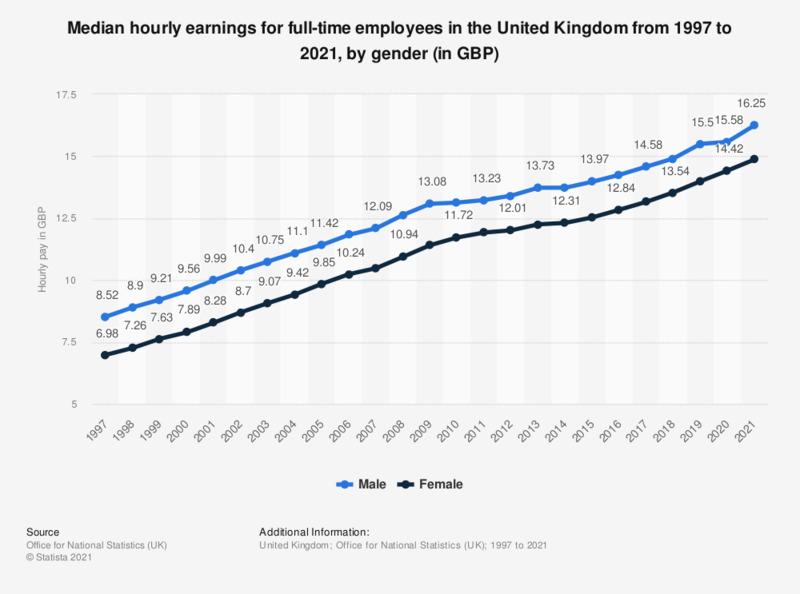 This statistic shows the gender pay gap in the United Kingdom (UK) from 2006 to 2018. The 'gender pay gap' is defined as the difference between the median hourly earnings of full time employees for males and females (excluding overtime pay and hours). The male figures are consistently higher than those of females. In 2018, females earned on average 13.55 British pounds per hour, compared to male employees who earned 14.93 British pounds per hour. ** Due to classification changes in 2010, there is a discontinuity from 2010 to 2011. The 2011 figure used is that using the latest (2010) classifications. This makes the 'Male' figure 1 pence higher than with the old classification and the 'Female' figure 16 pence lower. *** 2017 figures are provisional. Everything On "Gender inequality in the UK" in One Document: Edited and Divided into Handy Chapters. Including Detailed References. Does gender have an impact on pay?